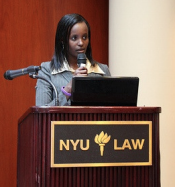 NEW YORK, April 20, 2009 – Miracle Corners of the World (MCW) demonstrated its continued support for genocide prevention yesterday by organizing a panel discussion on post-genocide Rwanda. 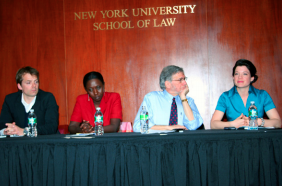 As millions around the world gather this month to remember the victims and survivors of the Rwanda genocide, the three distinguished panelists spoke about issues of denial, memory and justice fifteen years after the 100-day tragedy that, according to Rwandan government estimates, led to the killing of more than one million Tutsis and moderate Hutus. The event, which was moderated by Sarah Nadeau, Deputy Director of the non profit Council for Prejudice Reduction, was organized by Jacqueline’s Human Rights Corner, a genocide prevention program founded by MCW fellow and Rwanda genocide survivor, Jacqueline Murekatete, under the umbrella of MCW. It follows a gathering memorializing the Rwanda genocide earlier this month at the Church Center at the United Nations. Entitled “Remember, Reflect and Respond,” the commemoration featured survivor testimonies and multi-faith prayers. With over 300 attendees, both events generated significant awareness of the 15th anniversary of the Rwanda genocide and the current challenges facing survivors living in Rwanda. The events also recognized Rwandans’ commitment to build a peaceful and prosperous future after one of this century’s most tragic events.